Athletes place the the anterior cruciate ligament of the knee under a tremendous amount of stress. If left untreated, ACL injuries can lead to cartilage damage. ACL injuries are far more common in young women athletes than in men, but we don't know why this is so. ACL surgery involves the reconstruction of the ligament. While numerous ACL surgery techniques exist, your doctor will recommend the best approach based on your injuries and condition – to return you the full range of motion and stability to the knee. Lance Lehmann, MD has treated countless cases of knee injuries and arthritis. 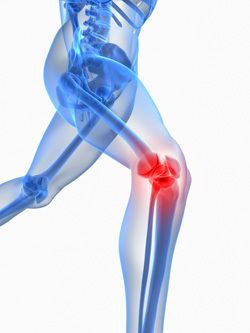 We will examine you, conduct physical tests and take X-rays to determine the extent of damage to your ACL. Nonsurgical options may be all that's needed, if the knee cartilage is undamaged, the knee proves to be stable during typical daily activities, and if the person never again wishes to participate in high-risk activities such a pivoting, or jumping. Your doctor may recommend reconstructive surgery if the knee gives way during typical daily activities, shows functional instability, or if the person continues to enjoy high-risk activities. Your surgeon replaces the damaged ACL with strong, healthy tissue taken from another area near your knee. You might utilize a strip of tendon from under your kneecap (patellar tendon) or your hamstring. Your surgeon threads the tissue through the inside of your knee joint and secures the ends to your thighbone and shinbone. In a few cases when the ACL is torn cleanly from the bone, it can be repaired. Less active people may be treated non-invasively with a program of muscle strengthening rather than knee surgery. Anatomical. ACL injuries are especially common in female athletes, due to many possible contributing factors. The most prevalent explanation proposes that female athletes tend to land more straight-legged than men, removing the quadriceps' muscles shock-absorbing action on the knee. Often the knee on a straight leg can't withstand this and bends sideways.